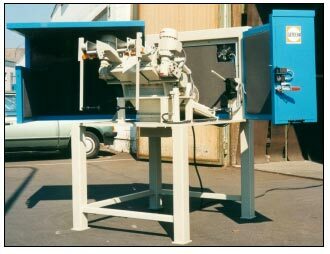 The RS 2000 Series granulators can best be summarized as a medium-duty version mid-sized granulators. Most common feedback existing owners comment on is the build quality and heavy duty nature of this series compared to other brands in the same size range. Segmented rotors to provide for most efficient stagger arrangement for your application to save energy, reduce RPM and deliver the best regrind quality. Staggered rotors for many applications to reduce RPM and noise levels while reducing the required motor size compared to non-staggered rotors. Fully accessible, tool-free design for safer maintenance and cleaning procedures. 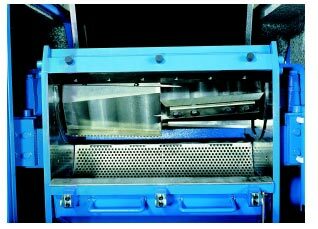 Standard, off-rotor blade setting fixture for quicker and safer blade replacement. 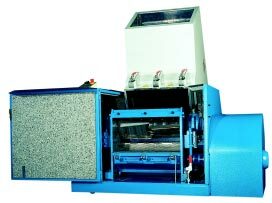 Continuous cutting circle for improved regrind, efficiency and operation of the your granulating needs. Easy to Clean FMC -15 Min. SOLUTIONS TO MEET YOUR NEEDS! Granulating of skeleton sheet after an Illig-line at a maximum construction height of 34 inches. 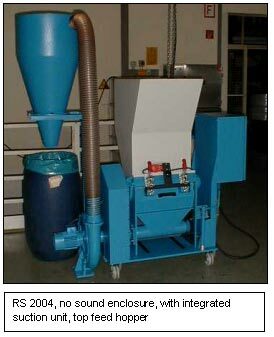 The granulator is RS 2000 Series w/ 10" rotor diameter. A control jaw could not be inserted as a result of tight space. Two light barriers transmit a signal to the frequency converter when the sheet is too tightly stretched. The feeding process is then switched off. 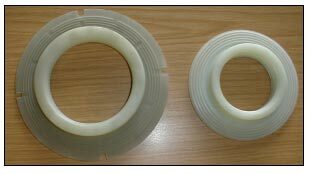 Should the thickness of the marginal strips be different, then the thicker marginal strip may press the feeding roller apart in such a way that the thinner marginal strip can no longer be clamped by the roller and will slide out of the infeed mechanism. 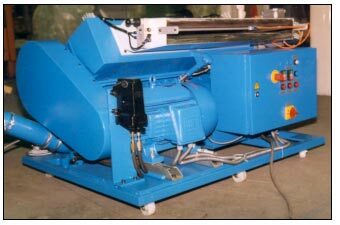 To ensure proper operation, it is therefore reasonable to apply one more infeed mechanism. 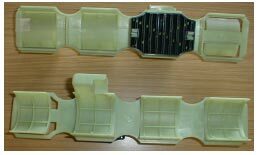 Both infeed devices have a drive-motor and are therefore independent in their speed. The loops of the marginal strips can thereby be compensated in such a way that approximately equal infeed forces brought to bear on both marginal strips. Potentiometers are mounted on the centre-point of the rotary axis of the control jaw. Angular changes on the control jaw convert the potentiometer/frequency converter to an Off-Set of the infeed speed. By this means, an automatic adjustment to the production machine is realised. 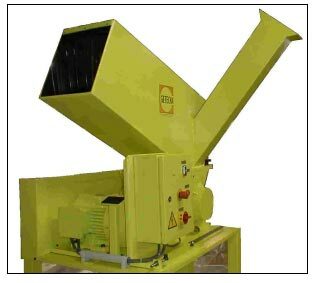 Width of the bypass hopper < 80 % of the cutting width radius The height and the angle of the bypass hopper must be designed in such a way that the profile and the opposite side do not rise up! 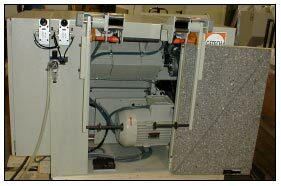 Granulator painted per customer specs. 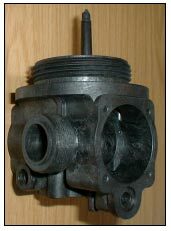 Depth:	A: 1.25" B: 2.25"	C: 3"
Wall thickness:	thin gauge, 1/16"
RS 2004: The unit handled the parts, these items represent the upper limits of material and wall thickness for the standard unit. Wall thickness:	�" to 5/8" max. RS 2004: handled the part, but feeding of this part needs to be metered. 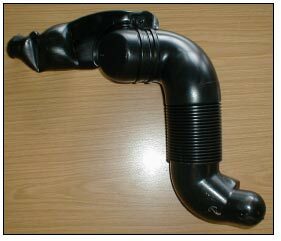 Wall thickness:	1/16 to 3/16"
RS 2004: No problems, needs bypass hopper. RS 2004: No problem. The piece can also be run in a smaller GRS 300. RS 2004 notes: The unit granulated the part, but due to the material, manufacturing process and required throughput, typically a RS 3000 series unit would be recommended. The RS 2004 granulated the part at peak of ability. Suggest a larger unit (ie. 3004) unless the unit will granulate mostly sprues and only occasional reject parts. 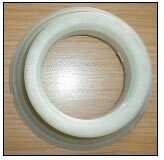 The RS 2004 unit is not suitable for batch feeding of this part. RS 2004 with a 7.5 HP motor is successful. Requires metering of the feeding process. 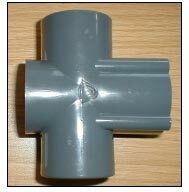 Wall thickness:	3/16" with beefiest part up to 5/16"
RS 2004: No problems encountered, should could also be granulated on a GRS 300. RS 2004: No problem encountered with the short pieces tested. Special bypass hopper required for feeding in long lengths.